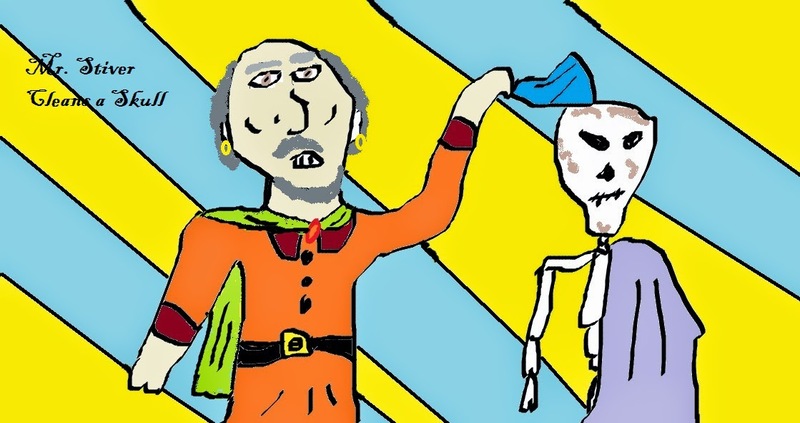 Retired sorcerer Salamand Stiver hates a dirty skull. No skull must go unpolished! “Who says?” I took my third polishing rag, the blue one with the lace fringe, and swiped it over the stone curvature of one long deceased sorcerer, Ramtongue Humbeetle. He’d burnt half the countryside to a crisp in his “burn and burn” campaign several years back. The Curlgarden Cavaliers followed him on their giant warthogs, but all it ended up doing is causing more pain and heartache. The mess I had to clean up after all that. My skin smelled of soot and burnt bacon for weeks! Mugley rubbed her hands together. “I love it when you say that.” She retrieved a twisted wand of black steel and glass from her pouch. I didn’t like using the damn thing. I was retired after all from “magicking.” I’d seen my fair share of scorched earth and exploding mountains in my day from rogue sorcerers. I had no intention of adding to the pile of messes they left behind. But when it came to nonexistent creaking doors, I drew the line. A door slammed. It creaked open again. It was definitely closer than it was only moments before. “Wand? Working?” The imp dug her talons further into my leather strap. “One moment.” I cracked the wand against, shaking it once green and yellow sparks jumped out. It illuminated the room. The creaking door horror revealed itself, lumbering down the hall towards us. A beast with long shaggy hair and brilliant pinpoint green eyes clawed a path down the hallway, smearing dust and grime behind it wherever it went. Its mouth was a small wooden door. It flapped open, creaked, then slammed shut. Inside the door were rows upon rows of nail-like teeth. Perfect for chewing up an old wizard and his impish sidekick. “Hurry!” I held the wand aloft, trying to think of a good spell to ward off a shaggy, door-mouthed tomb crawler. The swizzercazzle’s long fingers gripped the sides of the narrow hallway as it tried to cram its hairy form into the tomb with us. I pointed the wand dead between its eyes and fired the first spell that came to mind. Not sure why I used the 17 Century version instead of the 18th Century version, but sometimes I can’t help the way my tongue twists when I cast spells. A stream of spinning bones flew from the tip of the wand, slamming into the swizzercazzle’s face. Its knees buckled, but the spell only proved to anger him even more. His door-mouth opened and shut as if his head was a house full of fickle children. I didn’t have a second. The right arm of the swizzercazzle darted into the room and grasped my leg. I went up in the air and slammed hard against the stones of the tomb floor. Stars danced before my eyes as I tried to orientate myself. “Salamand!” Mugley shouted my first name. Not a common occurrence for an imp to refer to its wizard by first name. “I’m still here.” I groaned and scrambled to find my wand as the swizzercazzle drug my forward like a fisherman slowly reeling in his catch. The door-mouth flapped open, a dust-covered tongue welcoming me to the daemon’s throat. Mugley made an attempt to pry loose the long, tree branch-like fingers, but to no avail. It held me fast, the muscles in my leg tensing up. I pointed the wand again, hoping for something that would really rock the daemon right in the face. “Roving Jaguar Phantom!” I wished I had more control of my spells and whatever I blurted out. I’d always been that way though. Oftentimes it caused my power words to get crossed and have a magnificent fizzles that would nearly engulf my head. Oh well. Roving Jaguar Phantom wasn’t the worst spell I could conjure up. The spectral jaguar oozed out of my wand and seeped across the swizzercazzle’s mop of hair. Luckily, the blue flames managed to catch (a rare feat for such a weak spell) and the daemon released me from its death grip. While it tried to pat out its head, the flames got bigger and bigger until the red outline of the jaguar’s form raced along the body of the swizzercazzle. It yelped and retreated back down the hallway, leaving huge clouds of dust and ash in his wake. “That was close.” Mugley sat cross-legged on the floor, rubbing her wings. “Maybe you need to update your power words,” Mugley said.